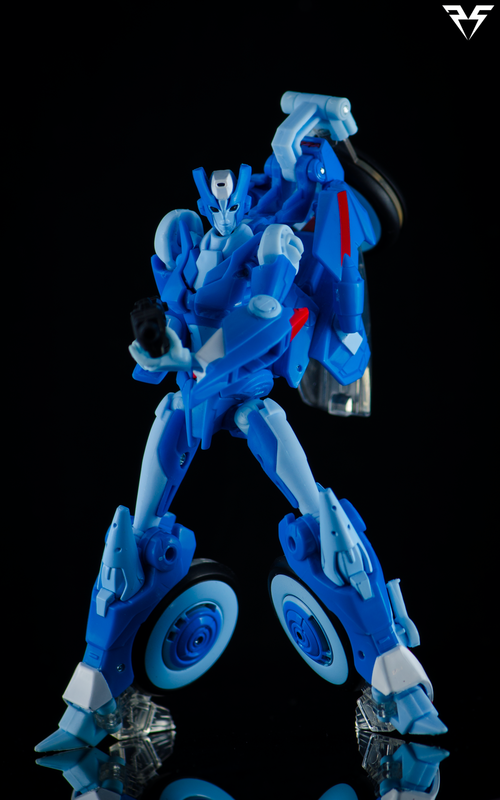 Much like Arcee, Chromia is a figure that has been a long time coming. 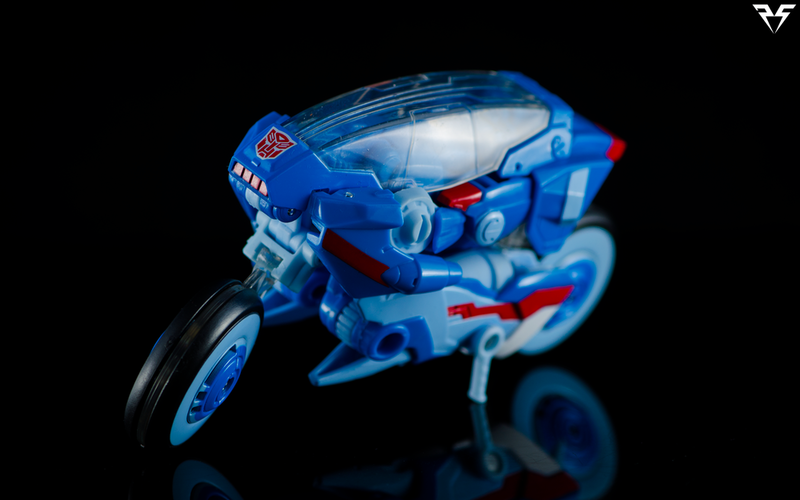 She's traded in her 4 wheeled cybertronian alt mode for a sleek 2 wheeled motorcycle mode. 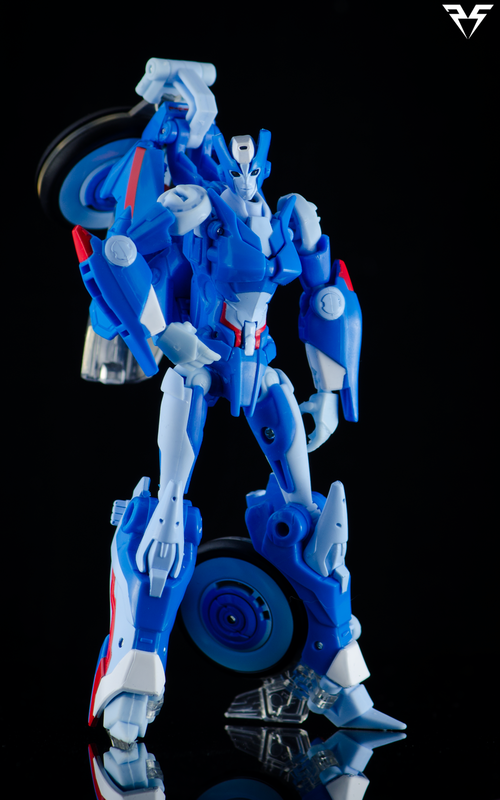 Based on the Transformers Prime RID Arcee mold, this figure has a ton of newly molded parts. In fact it's almost hard to tell she is a retool at all! With all new wheels, a new cockpit/windshield, new forearms and biceps, and various other changes including a brand new original head sculpt! Even side by side it's sometimes hard to see them as the same figure! 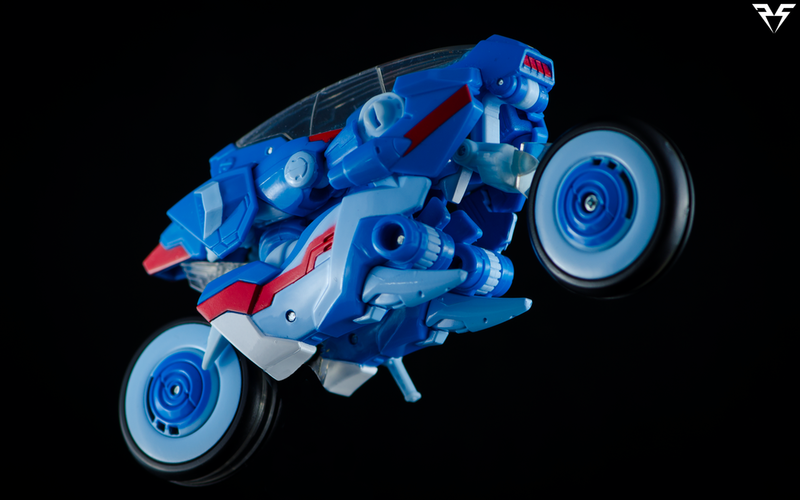 Chromia has a transformation almost identical to TFP:RID Arcee with the exception of the new cockpit windshield adding an additional step. There is a satisfying automorph function that reveals her head as you lower her hips and legs. Once transformed she becomes a lithe and agile warrior capable of taking on any Decepticon threat! Her bot mode design is a combination of her G1 bot mode with a healthy dose of IDW comics influence. If you haven't checked out IDW Comics Windblade mini series I highly recommend it as Chromia features quite heavily. For weaponry she comes with one large black pistol. Though she is pictured on the card back with Arcee's smaller pistol as well, there is a sticker note applied stating the figure only comes with 1 gun. Unfortunately her windshield does not remove to become a riot shield like it does in the comics. Chromia was featured briefly in the Transformers G1 cartoon and hasn't really had much representation since. Her addition to the IDW comics universe in Transformers: Windblade has brought the character some much needed love and modernization. Chromia and Arcee have both been a little hard to find in the wild depending on distribution in your area, so my best advice for those looking to purchase her would be to put an order in online before they disappear. Despite low availability it's nice to see Hasbro putting out an effort to bolster the Fembot ranks and Chromia is a great addition. Check out more shots in the Gallery below!